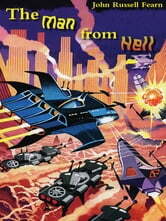 This volume collects four classic tales from the SF pulp magazines by a master of the genre! From top to bottom the Brant Building became insubstantial, like the illusion of a dream world. It hung transparent, incredible, for a moment with the figures of people momentarily visible through the suddenly glassified walls--then with staggering abruptness the whole 1,000-foot mass snapped into black extinction! Its very foundations changed to cavernous darkness. Where there had been the Brant Building, there was nothing but an abysmal crater, sheerly cut. A yawning emptiness divided the two buildings on each side, both of them quite untouched. Such was the vengeance of Dake Bradfield, the scientist who had been murdered on the orders of industrialist Marvin Brant--but who had returned to life as THE MAN FROM HELL!